I always believe a sign of a good meal is if you’re still talking about it the next day. And after popping along to The Spiritualist to try out their Aberdeen Restaurant Week menu, this became the case for me as I gushed to my colleagues about my meal on Monday morning. 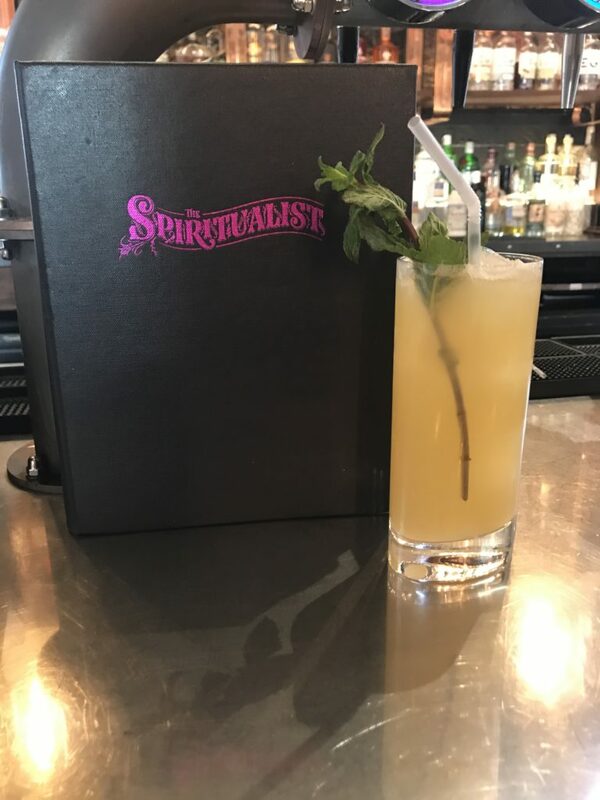 The Spiritualist, situated on Langstane Place, burst onto Aberdeen’s bar scene last year with its unique and exciting range of fun and fabulous cocktails and drinks. I couldn’t go on Instagram on a Friday night without seeing people posting videos of ice spheres being cracked open with miniature hammers to let the fruity cocktail inside seep out and fill up the glass it was served in. And yes, I’m one of those guilty people, too. But what about The Spiritualist’s food offering, I wondered after opting to try out their ARW menu? I won’t lie, I hadn’t heard much about it and really wasn’t expecting much more than your standard pub grub. Feeling sceptical but optimistic, I went along to the bar with my mum to see if the food was as good as the cocktails. And much to my delight, it really was. Even my mum – who, let me tell you, is very hard to please when it comes to food – has already planned to re-book a table for this week with her partner. So if that isn’t a good sign I don’t know what is. 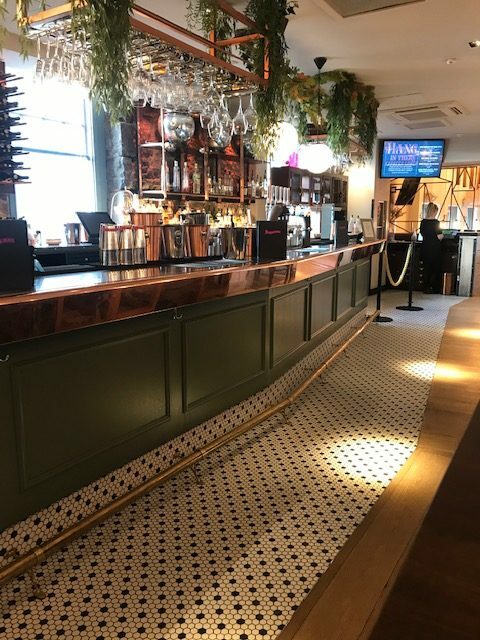 Easy on the eye, The Spiritualist is extremely Instagrammable, with its copper splashes, funky lighting and attractive bar which is draped with greenery. On arrival we were greeted by Ewan who was very pleasant and showed us to our leather booth across from the bar. He handed us our menus and explained we could mix and match the dishes if we wanted to, as the dinner menu was also being served during the day. Handy to know, I thought. My mum and I decided we’d go for a main and a dessert each from the lunch menu. 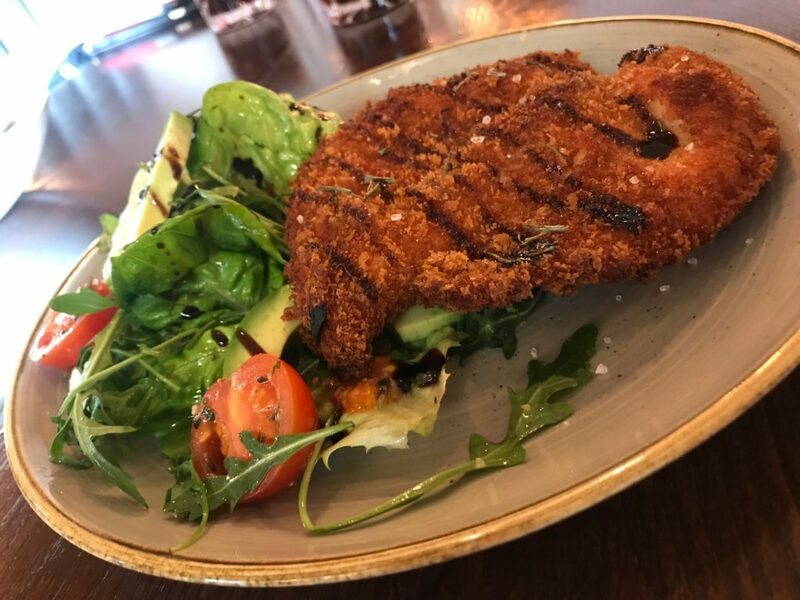 I opted for the chicken schnitzel which came with avocado, a mozzarella salad and black pepper fries. The dish usually comes with pancetta, but I asked for it without. 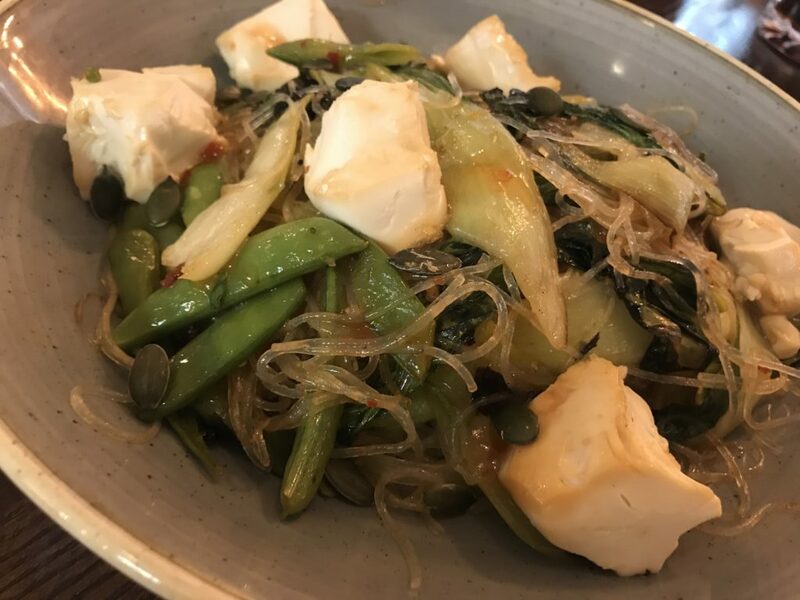 Across the table my mum went for the vegan crispy tofu stir fry which consisted of glass noodles, pak choi, sugar snap peas and sweet ginger sauce. Unfortunately, we did have a little wait for our mains, but we understood why as it had been explained to us that everything is made fresh. And not to sound cliched, the food really was worth the wait. The chicken was a generous size and had been drizzled in balsamic. It had been cooked perfectly, it was tender and juicy and went down well with the crunchy breadcrumbs. The side salad was quite clearly fresh. The sweet tomatoes were bursting with flavour and I wolfed down the avocado – a nice addition to the salad. Although, only after leaving the bar, I realised they forgot to serve my fries. A sucker for a stir fry, I muscled in on my mum’s choice, keen to try it out for myself. And I was so glad I did. In fact, I kind of wished I’d ordered it instead. The ginger sauce hit the back of my throat with a punch, but it wasn’t overpowering. For someone who loves ginger, it was a winner. The glass noodles were covered in the sweet sauce, as was the veg and they all complemented each other so very well. The tofu pieces were large and very soft, almost slippy in texture. They didn’t taste of much, but this was balanced out with the ginger flavour so for me, it didn’t matter. My mum happily tucked into the dish which she thought was a very generous portion. She declared that she’d definitely order it again and, quite frankly, I want the recipe! 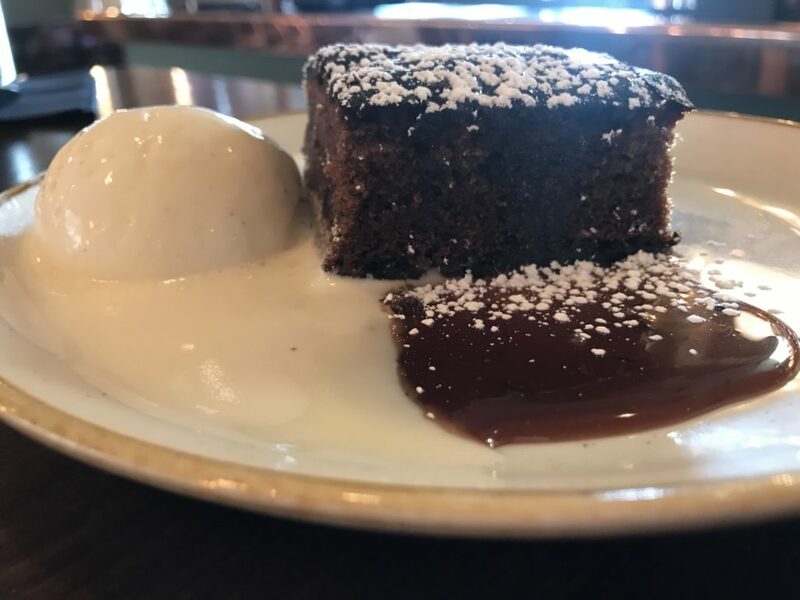 After deciding to retire on our mains, our table was cleared and we ordered the two desserts on offer; homemade sticky toffee pudding, and vegan sorbet with an apple and orange compote. Ewan explained to us they were pairing their desserts with a cocktail as part of Aberdeen Restaurant Week. 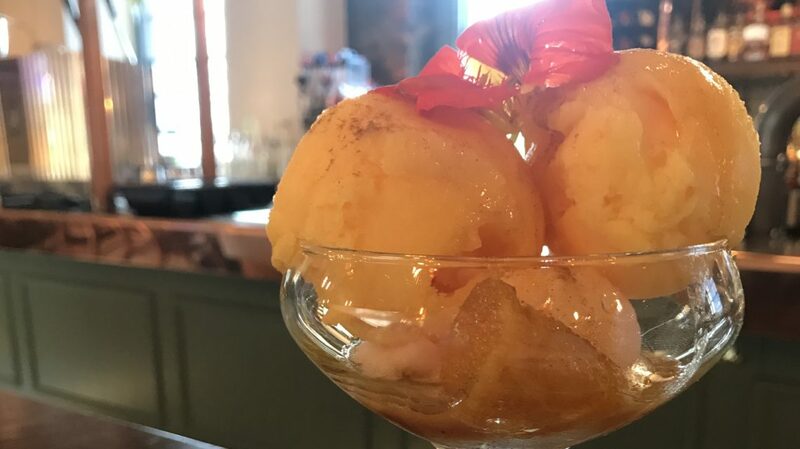 I was unfortunately driving, but my jammy mum across the table wasn’t and so she asked for the sorbet’s pairing cocktail. 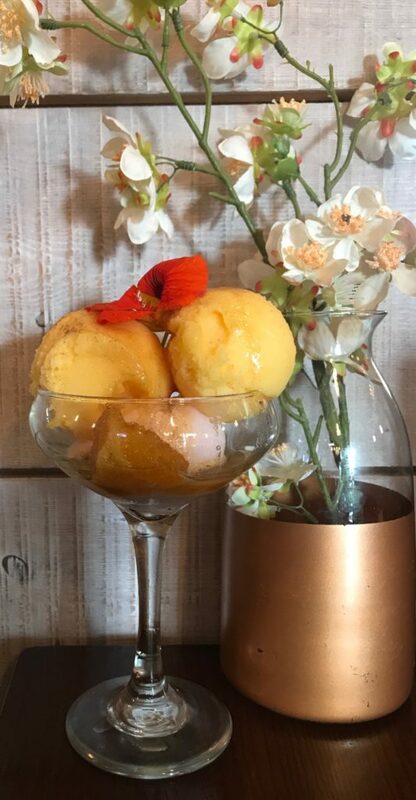 The sorbet arrived promptly and oh man… I need a second because I swear my mouth is watering just thinking about it. For what I thought might be a bland dessert was actually the star of the show. I couldn’t have been more wrong. A real palette cleanser, the sweet sorbet was so refreshing and the apple and orange compote underneath? Mind blowing. My mum practically shoveled it down my throat after she gasped and told me I just had to try it. The apple flavour was most prominent. Sweet and a little sticky – my mouth is watering again. And my mum, who isn’t a big drinker usually, practically downed her paired cocktail which consisted of lemon juice, vanilla, apple Ciroc vodka, apple juice, a touch of rose and violette liqueur and a sprig of mint to serve. The cocktail beautifully complemented the sorbet dessert, both so sweet to taste with apple flavours. But the rose and violette liqueur flavours were the most prominent with the cocktail tasting a bit like those old parma violet sweeties. While my mum mmm’d and ahh’d over her choices, I hoovered up the homemade sticky toffee pudding which came with just the right amount of sauce. I’m not a fan of sticky toffees which come drenched in sweet sauce, or huge slabs of pudding which I can never manage. Anyone can make sticky toffee pudding, but The Spiritualist made it just right. I left making a mental note to return to The Spiritualist for food. The bar has a real relaxed vibe, making it a really nice place to grab a bite for lunch or dinner. Everything tasted extremely fresh and you could tell that the kitchen really care what they are putting out. The Spiritualist is an all-rounder. 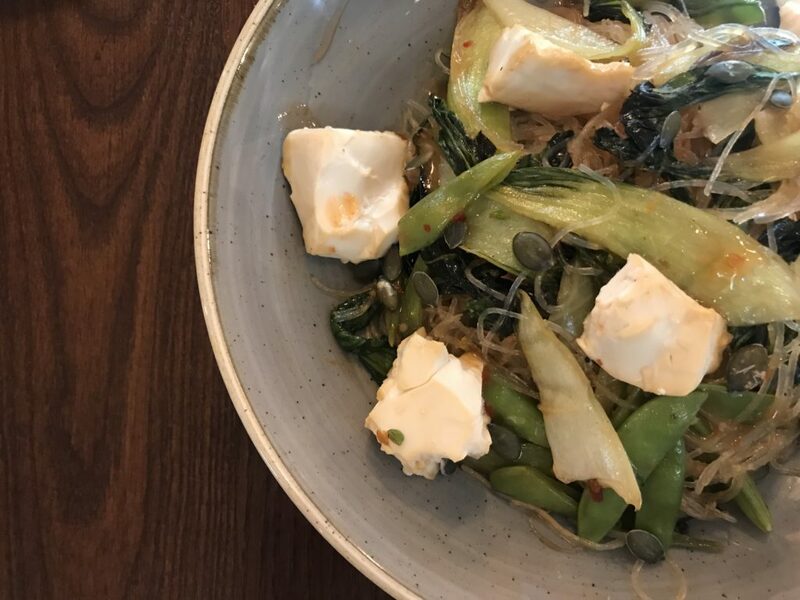 Great for drinks and great for food – they should be shouting about their food offering much more because people need to know that this bar is not serving any old pub grub – it is so much more than that. The fact that I couldn’t shut up about it at work the following day speaks volumes.